Hyderabadi chicken biryani is said to be the most popular among all other regional biryanis and the best north Indian food ever. Mainly this dish is based on basmati rice and goats meat, but can also use chicken instead of goat. 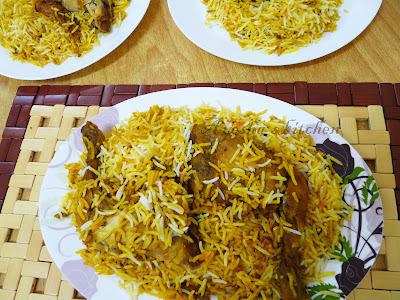 The blending of biryani rice and chicken in Hyderabadi dum biriyani recipe is almost the same like Malabar dhum biriyani or thalassery dhum biriyani. But the ingredients used and the way of preparation made it different from other regional biriyanis. 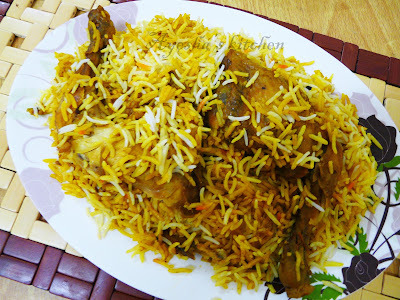 Hyderabadi chicken biryani is the spicy, fragrant and colorful variant of biriyani in India. Here am sharing the traditional way of making Hyderabadi biryani which is by cooking the raw marinated chicken with the half boiled basmati rice and kept on dum until done. This biriyani is quite rich and has an awesome taste with a mouthwatering aroma. Marinate the chicken with all the ingredients above given for the marination. Keep it aside for half an hour. Now the next step is boiling the rice. So take a vessel and add water (more than double the amount of rice). Switch on the flame. Keep the cloves, cinnamon, bay leaves, cardamom, nutmeg inside a cheesecloth or a muslin cloth and tie it tightly like a bag. Dip or put it in the water so that we get only the flavor. To this, add caraway seed/fennel seed, salt and let the water boil. When it starts boiling, add the rice and close the lid. Cook till the rice is more than half done. Check occasionally. When more than half done, drain the water in the rice and keep it aside. Remove the spice bag also. Now add the marinated chicken in a big nonstick vessel and check for salt. We are going to cook chicken and half done rice together. Now drop half of the boiled rice over the marinated chicken, then spread chopped coriander-mint leaves, fried onions, cardamom powder, garam masala powder and 4 tbsp of ghee. Again layer the some boiled rice over this layer. Garnish with coriander-mint leaves, fried onions, cardamom powder, garam masala powder and saffron soaked milk. Spread remaining ghee on the top uniformly. Close the lid tightly and can keep some weight on the vessel (optional). Or can close all the ends of the vessels with maida / all purpose flour dough. Allow it to cook for 15 minutes in a medium flame and when steam starts to come, lower the flame and cook for another 10 minutes. Yummy Hyderabad biriyani ready. Serve hot with Raita/salad. I have to make this .. I love Indian food! This is my favorite! Thank you for the recipe.